GUANKE Natural wood watch is handmade with 100 % natural wood material without paint, it is very lightweight and comfortable to wear. It is unique cool style handmade watch. 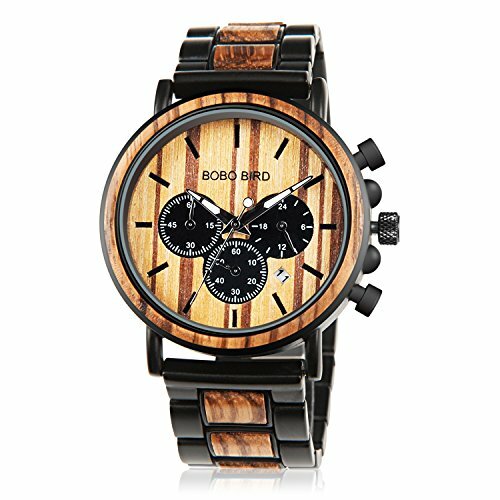 Notice: Made of 100% natural wood, there may be some spots on the watch, It is not the quality problem. And also maybe the natural colors of them are slightly different from each other and color difference. 1. Don't strike or pull the watch violently. 2. Wipe the watch now and then, the color will be brighter. 3. Do not expose the watch to to sunlight or light for a long time, or it will turn into dark green. 4.Getting it a little wet is fine,but not swim or shower with it on, the wood would react poorly to water. *Large dial,3 subscale timer,calendar display ,luminous hands;wide watch chain, butterfly clasp ,equipped with strap adjusting tool,simple and practical comfortable and safe,Simplicity of business casual, bring you back to the classic. *lifetime quality assurance, best customer after-sale service and full support within 24 hours. If you have any questions about this product by GUANKE, contact us by completing and submitting the form below. If you are looking for a specif part number, please include it with your message.